From now till we move in I have the plan to share with you a design for a room in our house. Since Mike and I have spent the last 2 years dreaming about what these spaces would be so it is really fun to show you how the plan before we get to showing you the finished product. 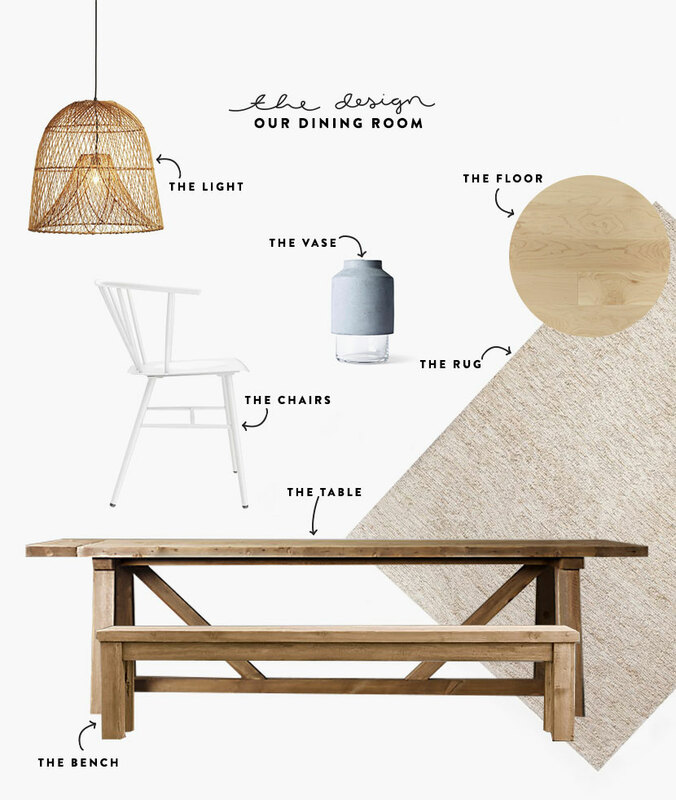 This week we are sharing our about the focal point of our home: The Dining Room. 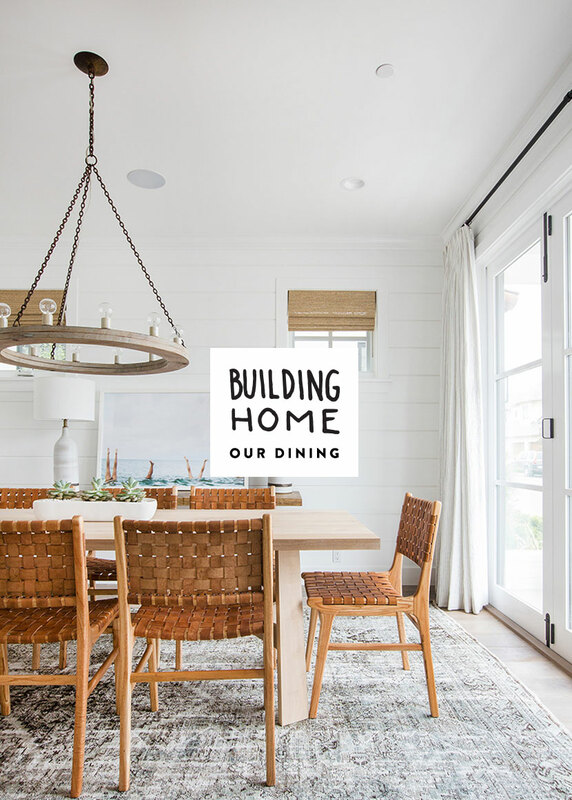 Last week I shared our Kitchen and the week before our Living Room so make sure you see those so you can see how these rooms play together before jumping into the design. This is the room that connects them both so it is important they act as the flow between them. This is also the first thing you see when you enter the house as you can see in the design below. 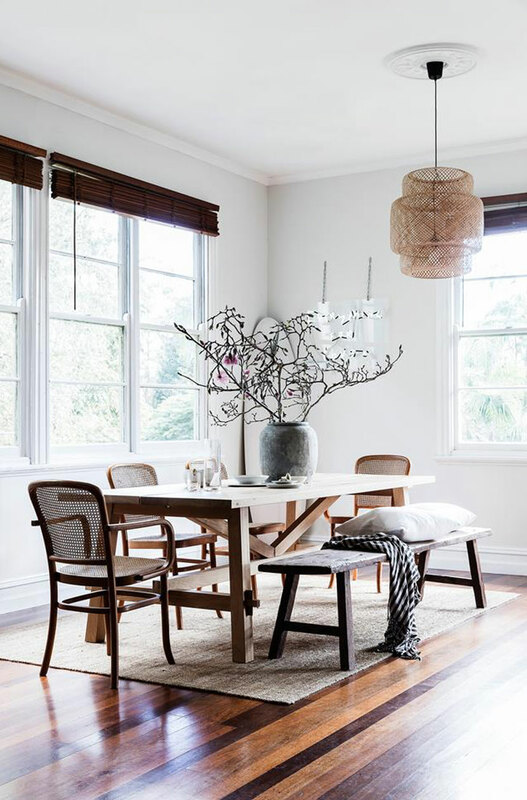 When designing the space I wanted to open our front door and see straight to the dining table. We plan for this to the be the focal point of our home and the heart of our home. Our family loves to cook and eat, but most importantly we love feeding other people. So we wanted every guest that comes to our home to feel as if the table is accessible to them. Some say the kitchen is the heart of their home and for us…on some level it is, but we feel life unfolds the most around the table. That said, this space will see a lot of transition change and more throughout the year so we wanted to make a simple and flexible space but still hit the mark on style for us. When I was looking for inspiration I was most inspired by two things. My English heritage and english farmhouses and Scandinavian lighting and minimalism. We spent time in the Danish Design Museum while we were in Copenhagen and I had a new appreciation for dining. Not to mention all the visits to cozy pubs in England while visiting family there really impacted me. I wanted to somehow combine both those aesthetics. So I looked for spaces that brought those feelings together. We wanted to have seating that could transition and a table that could lengthen. Since our house isn’t wide enough for a huge table, but it is long enough we wanted to set it up in a way that if we wanted we could turn it and put in leaves to extend the table for more than 8 people but possible 10-12. I also knew my dream of some epic end chairs wouldn’t work because the room wouldn’t allow for flor reasons, but I loved that we would have plenty of space to move around. We knew from past experience a bench can work to sit one extra person if need be as well. Plus, we love having a bench with kids. It makes a fun and easy seat for them as they start to get bigger. 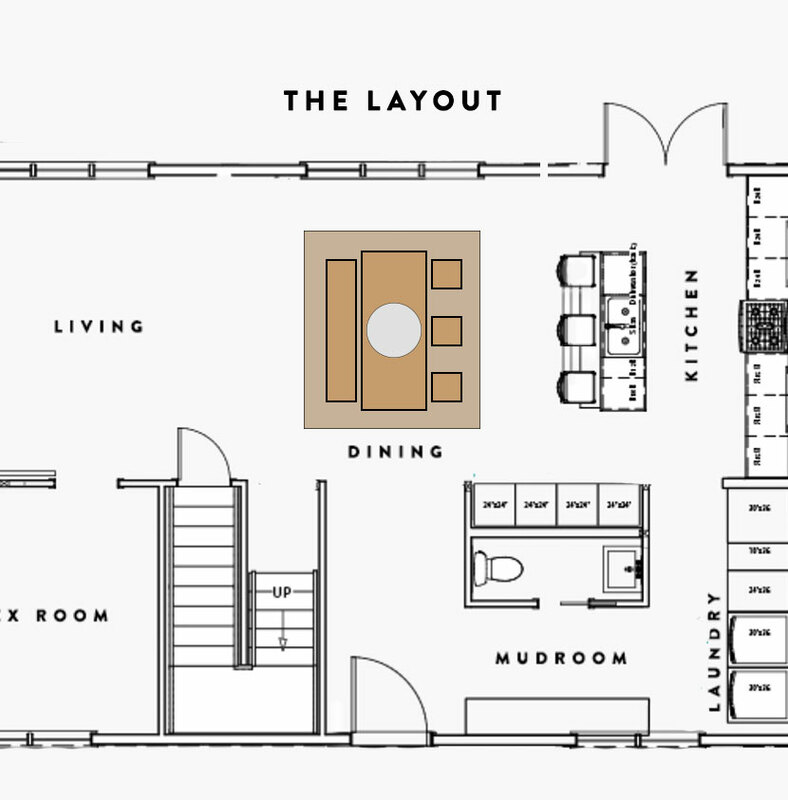 Here you can see the layout and how things will be laid out in the house. In the entry hall we placed can lights so that the focal point would remain the light over the dining room table. We also wanted the window and front door to all center on the table. Growing up my dad always said when you walk into a house you should either look through the house to the outside or see a fireplace so we setup the room to look straight out over the rolling hills. This is probably the piece I am most excited about in our home. So what type of table and everything did we choose, here you go! We already have chairs we plan to repurpose that are similar to the ones below. We are planning on sanding and painting them in white or a light gray to match our cabinets. We haven’t decided just yet. Our light is currently on its way and we cannot wait to see if the size is ACTUALLY what will work. We wanted something bit but not heavy and I loved this one with its clean lines and natural texture. Finally, for a while we will be using our dining table we used to have at our house in Raleigh (one of our only large furniture pieces we didn’t sell). It is a table my dad made and we love but isn’t the right size for the room. Eventually it will be used as my work table in the house. This table though is the one we are saving for. It is most likely one of our largest investments for our home, but one of the most important to us. Working extra hours to make it happen for the space! So tell me what do you think? 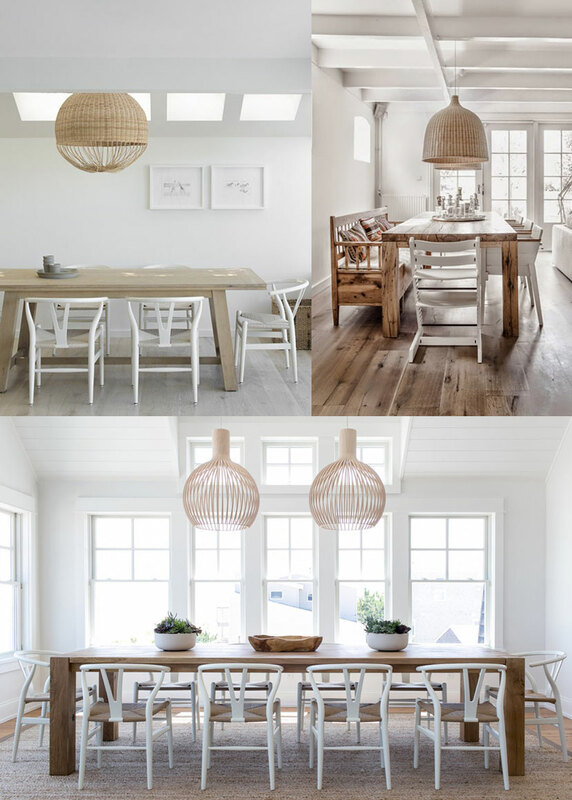 If you were designing your dream dining space what inspiration would you pull? So great! You guys are so lucky to be able to start from scratch with a home. I found that when I was putting together my baby’s nursery – being able to start with a theme, a moodboard etc… helped really make a beautiful, cohesive space. I can’t wait to see how everything turns out! 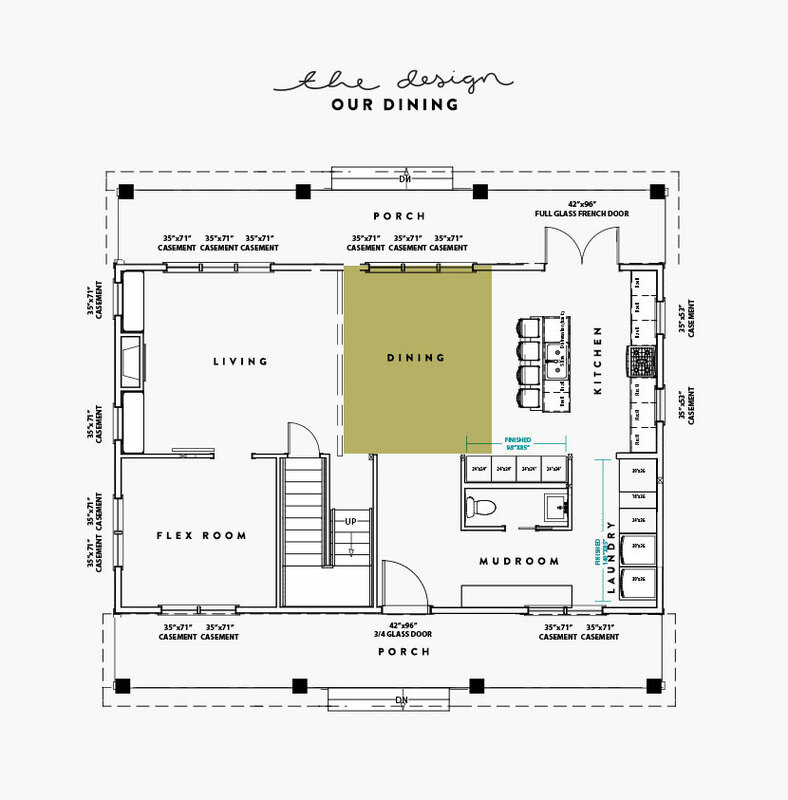 I get really excited seeing you plan your joint dining room / kitchen areas. I agree that it’s the heart of the home, and i think what you have so far really encourages that. I love benches for that reason, they’re more inviting, casual, yet still visually appealing. My two cents? I think the chairs could be light-mid gray to help with wear and showing less mess. mine are all white, and they never LOOK clean! I think the gray will also make the chairs / space feel warmer than white. but love, love, love your style. Have you heard of Neighbor’s Table (http://www.neighborstable.com/about/)? They seem right up your alley, make incredibly beautiful tables for just the way you hope to live in and love in and maybe cheaper then Restoration Hardware (and truly one of a kind)… just a thought 🙂 I’ve loved following along as you share your dream home and can’t wait to see the rest, absolutely beautiful! This is awesome!! I just checked it out! I think these would be awesome for our outdoor table because they are too large for our house, but I am going to get in touch with her! This is a beautiful concept.